The Falling Rock Cafe is centrally located in Michigan’s Upper Peninsula as you pass through Munising, MI on M-28. Our one and only stop light is right out front and you can park down by the bay, take in the scenery of beautiful Munising Bay on the Lake Superior shoreline and walk across the street for lunch. Please feel free to stop by for a visit or contact one of us below with any questions, comments or general inquires. We offer a wide variety of catering services for special events and meetings, and welcome large parties or private events in our café. If you would like more information about catering for your special event or reserving the café, please give us a call at 906.387.3008 or email Nancy. We’d be happy to try and accommodate you! The Falling Rock is grateful to be included on this list of The 10 Best Live Music Venues in Michigan. Thank you to all of our great musicians and supportive audiences for helping us get included on this list! If you are a musician and would like information about performing at The Falling Rock Café and Bookstore, please email Nancy. The Falling Rock Café and Bookstore works hard to provide a diverse selection of new and used books, along with a special section dedicated to local authors and regional lore. 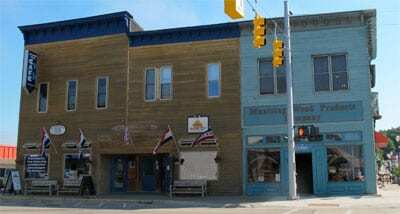 We have declared ourselves as one of the Upper Peninsula’s most unique bookstores, with over 30,000 titles in subjects ranging from Great Lakes shipwrecks and local Native American history to New York Times Bestsellers and illustrated poetry books. Please contact Nancy for information about how to order books including new, used, rare or out of print books. You can also search titles and purchase through our online bookstore!